Belgium should make it explicit in its national legislation that police may only use a firearm to stop an imminent threat of death or serious injury. The Belgian Constitution is the supreme law of Belgium. It was originally adopted on 7 February 1831 following Belgium's declaration of independence a year earlier. On 14 July 1993, the Constitution was substantially revised, transforming the country from a unitary state into a federal state. The most recent revisions to the Constitution were adopted in 2014. Fundamental human rights are enshrined in the constitution, though surprisingly not explicitly the right to life. According to Article 23, however, everyone has the right to lead a life in keeping with human dignity. By virtue of Article 12, the freedom of the individual is guaranteed. The organisation and competence of the integrated police service, structured at two levels, are regulated by the law. In carrying out their administrative or judicial police duties, any police officer may, taking into account the risks involved, use force to pursue a legitimate aim that can not be achieved in any other way. Any use of force must be reasonable and proportionate to the objective sought. 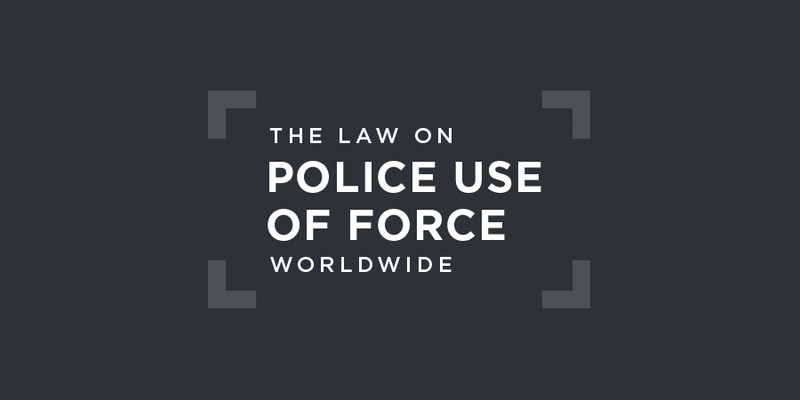 Any use of force is preceded by a warning, unless the use of force would become ineffective as a result. 3. In a case of absolute necessity, where the police officers … can not defend the persons, posts, transport of dangerous goods, or places entrusted to their protection in any other way. 4. In a case of absolute necessity, where the police officers … can not defend the persons who have been entrusted with their protection in the framework of the execution of an order of the judicial police in any other way. In this case, the firearms may only be used in accordance with the guidelines, and under the responsibility of, a judicial police officer. The use of weapons regulated in paragraphs 2, 3, and 4 shall only take place after a warning in a loud voice or with any other available means, including a warning shot, unless this would render the use of force ineffective as a result. The English translations of the relevant provisions are unofficial. can not be achieved in any other way and for the period strictly necessary for that purpose.Art. 119(1), Law concerning the prison system and the legal status of the detainees of 12 January 2005 (unofficial translation). Any use of force must be reasonable and proportionate to the objective pursued.Art. 120(2), Law concerning the prison system and the legal status of the detainees of 12 January 2005 (unofficial translation). be threatened, unless circumstances do not permit it or if a prior threat would make the use of force ineffective as a result.Art. 120(3), Law concerning the prison system and the legal status of the detainees of 12 January 2005 (unofficial translation). in a special register specifying the circumstances which led to the adoption of the safety measure, the time at which the measure was taken and the duration of the measure. The special register shall be kept available for the chairman of the Supervisory Committee, the monthly commissioner and the other supervisory authorities.Art. 121, Law concerning the prison system and the legal status of the detainees of 12 January 2005 (unofficial translation). In Belgium, police oversight is vested in three bodies: the Standing Police Monitoring Committee (generally known as Committee P); the General Inspectorate; and the Internal Oversight Service. Committee P, which was formed in 1991, has operated since 1993 as an external body with the responsibility to monitor the actions of the police. Its mission statement declares that it serves as an independent and neutral body to‘assist the legislature. The General Inspectorate is under the direct authority of both the Minister of Interior and the Minister of Justice. The Internal Oversight Service functions within the police force at a decentralised level throughout municipal police offices in Belgium. of reports that, in some cases, law enforcement officials use excessive and unjustified force during questioning or arrests. The Committee deeply regrets the fact that Jonathan Jacob reportedly died in a cell at the Mortsel police station on 6 January 2010 after being subjected to physical violence by police officers. The Committee also deeply regrets the fact that, three years after the event, the investigation has not been concluded and the perpetrators have not been brought to justice and therefore remain unpunished.Committee against Torture, Concluding Observations on Belgium, UN doc. CAT/C/BEL/CO/3, 3 January 2014, §13. Despite the efforts of the State party to strengthen the independence of the Standing Committee for Police Monitoring (Committee P) and its Investigation Service, the Committee remains concerned by the fact that some of the investigators are former police officers, which may compromise their impartiality when they are required to conduct objective and effective investigations into allegations that acts of torture and ill-treatment have been committed by members of the police.Committee against Torture, Concluding Observations on Belgium, UN doc. CAT/C/BEL/CO/3, 3 January 2014, §13. (e) Take appropriate measures to further strengthen supervision and monitoring mechanisms for the police force, particularly Committee P and its Investigation Service, which should be composed of independent experts recruited from outside the police.Committee against Torture, Concluding Observations on Belgium, UN doc. CAT/C/BEL/CO/3, 3 January 2014, §13. The European Court of Human Rights has adjudicated a number of cases involving police use of force in Belgium. In this Grand Chamber judgment of 2015, the Court found that the police had violated the prohibition on inhumane treatment in Article 3 of the 1950 European Convention on Human Rights. Two brothers, one of whom was a child, claimed that two police officers had slapped them in the face at the local police station in the district of Saint-Josse-ten-Noode in Brussels. The court declared that ‘"n respect of a person who is ... confronted with law-enforcement officers, any recourse to physical force which has not been made strictly necessary by his own conduct diminishes human dignity and is, in principle, an infringement" of the right to freedom from torture and inhuman or degrading treatment.European Court of Human Rights, Bouyid v. Belgium, Judgment (Grand Chamber), 28 September 2015, §§88, 100. In this 2011 Chamber judgment, the Court was asked to judge whether Belgium had violated the Convention when two police officers shot a reporter, seriously injuring but not killing him, while he was filming the operations of an anti-gang squad in the Belgian police. He had been granted authorisation for the filming by the authorities. While the actions of the officers, who were unaware of his presence and role during the specific operation, were adjudged not unlawful per se, the failure to properly supervise the applicant was found to be attributable to the authorities, and their lack of due vigilance meant that the potentially lethal force used had not been absolutely necessary "in defence of any person from unlawful violence", within the meaning of Article 2(2)(a) of the European Convention.European Court of Human Rights, Trévalec v. Belgium, Judgment (Second Section), 14 June 2011. In this 2009 Chamber case, the applicant had alleged that during his arrest he had been pinned to the ground, handcuffed and struck by three police officers. He had then been dragged along the ground to a vehicle, and had been subjected to racist threats and insults during the journey to the police station, where police officers had struck him again and hit him on the head with a seat and a telephone directory. According to the Belgian Government, during the arrest the police officers had been required to use a pepper spray and to "kick the applicant’s feet out from under him", thus knocking him to the ground, in an attempt to control him. The applicant appeared to be under the influence of drugs and fought violently, so that it was impossible to place handcuffs on him. The police officers had been surrounded by people who began to strike and insult them. Mr Cakir himself had been kicked by those individuals. A medical certificate drawn up on the following day recorded a substantial bruise with complete ptosis of the applicant’s right eye, bruising on both wrists and the left hypochondrium, a stitched wound on the left eye socket and the scalp, a fracture of the root of the nose, pain in the right hypochondrium with headaches and pain in the left mandibular region. The applicant was hospitalised for ten days. One of the police officers was declared, among other things, unfit to work for one day. The Court held unanimously that there had been a violation of the prohibition of inhuman or degrading treatment by the police both substantively and procedurally (on account of the ineffectiveness of the investigation conducted into the incident), and also a failure to carry out all the necessary measures to examine whether the police officers’ conduct had been discriminatory. The use of violence by police officers, not strictly necessary, against a person deprived of liberty or confronted with police officials affects human dignity and, as a general rule, constitutes a violation of Article 3 of the ECHR, as interpreted by the European Court of Human Rights. This treaty provision, as interpreted by the European Court of Human Rights, obliges the State, if a person credibly asserts that they were treated by police officers in a manner that violates the treaty provision, to conduct an official investigation that must be effective, in the sense that it must lead to the identification and punishment of those responsible.Cass. 13 September 2016, AR P.14.1298.N.